Meatloaf with Carrots and Brussels Sprouts, and leftovers! As far as I’m concerned, Meatloaf is the perfect comfort food. Not only is it delicious on the first night, but the next day its fabulous crumbled into an omelette with some spinach. For this meatloaf, I mixed ground beef with two of Copari Meat’s delicious mild pork sausages. Cook onion, garlic, zucchini, carrot, celery in butter in a large heavy skillet over medium heat, stirring occasionally, 5 minutes. Remove from heat and stir in Worcestershire sauce, vinegar, herbs. In a separate bowl, combine the beef, sausages, eggs with hands. Add in the cooked vegetables and mix together well (use a spoon as it’s hot and I burned my hands!). Pack mixture into a 9 x 5 inch loaf pan. Bake at 350 degrees F until an instant-read thermometer inserted into center of meatloaf registers 155 degrees F. Let stand 10 minutes before serving. 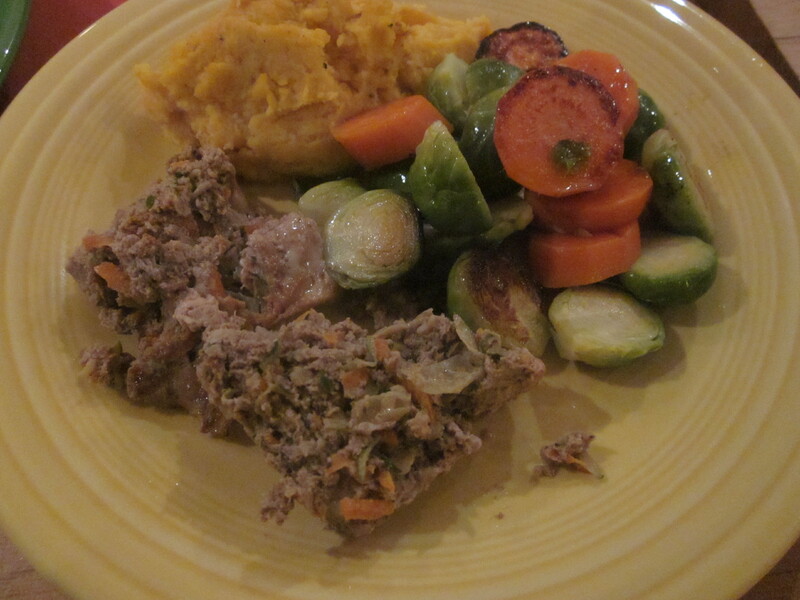 (I found that there was a lot of fat in my meatloaf, so rather than adding any oil to my Carrots and Brussels Sprouts, I used this tasty fat – and it was good). The combination of flavours and textures of these two vegetables work really well together. 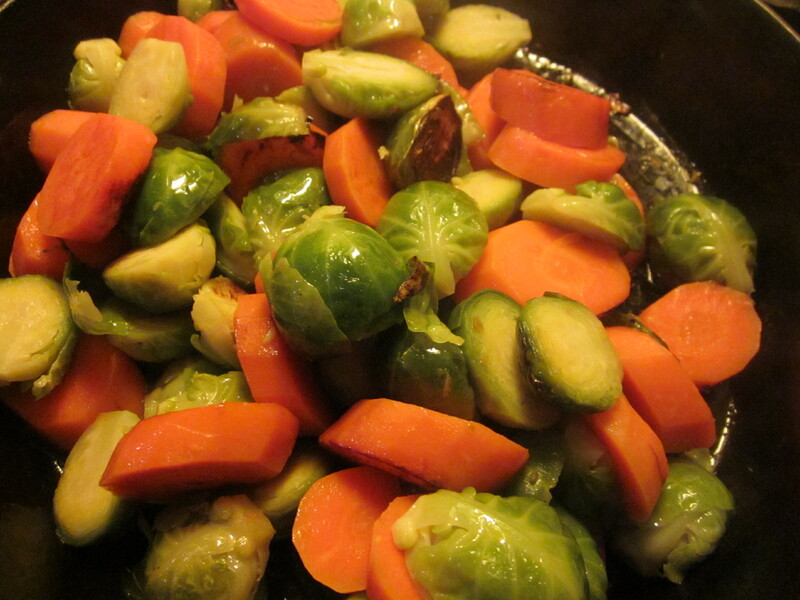 In 2 Tbsp of butter, in a heavy skillet over medium heat cook the carrots and Brussels Sprouts with salt and pepper, stirring occasionally until vegetables begin to brown (3 to 4 minutes). 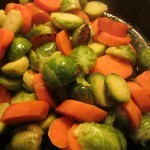 Add water and cover skillet and steam vegetables until vegetables are tender (5 minutes). Stir in vinegar and remaining tbsp of butter. 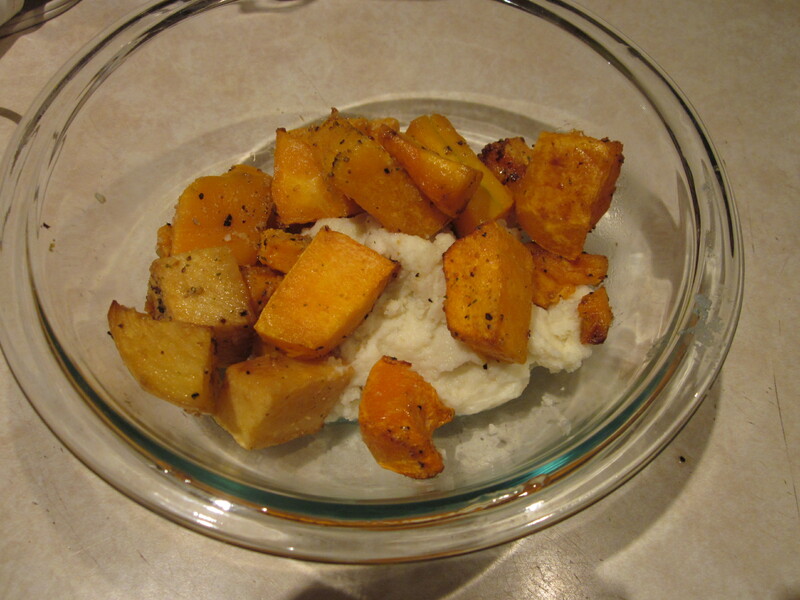 Leftover mashed cauliflower, mashed with roasted squash. I’ll be honest, I find the most delicious combinations when combining my leftovers! The night before we had the Meatloaf we had mashed cauliflower, and for lunch today I roasted some carrots and squash to have with my sprout and green salad. Neither was enough on its own, but mashed together the two were delicious! If I didn’t have leftovers, I probably would have added either some squash or turnip to round out the flavours of this meal – or if you wanted to have a rice-like texture, chop up steamed cauliflower and broccoli into small rice-sized pieces, and they would be perfect! 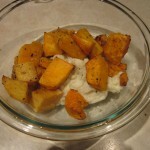 Just made the most delicious dinner from Fine Cooking magazine (p 12 of Cookfresh Spring 2012 issue). Grated carrots, zucchini, mint and lime with spicy peanut noodles – what a tasty meal. Serves 4 easily (actually could serve 6). Bring a large pot of salted water to a boil. Add the rice noodles and cook, stirring often, for 5 minutes until just tender. Drain and rinse with cold water, leave to drain in colander. Meanwhile grate the carrots and zucchini and chop the mint and peppers. Set aside. In a small bowl, whisk together the peanut butter, vinegar, fish sauce and 3 Tbs. warm water until smooth. Set aside. In a large skillet, cook the turkey in the coconut oil over medium-low heat. When just cooked through (about 6 – 8 minutes) add the tamari. 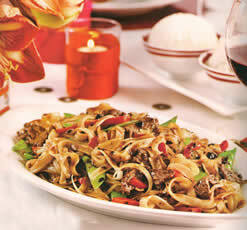 Then stir in the rice noodles, sauce and vegetables. Add the juice of 1/2 lime and serve. Garnish with lime wedges (from the other 1/2 of the lime!). This was delicious served with a mango salad. I find getting back into the swing of things difficult after taking time off! But today the kids are back at school, everything is getting back to normal around me, all the Christmas decorations are packed away, and I’m ready to start writing again. While enjoying the holidays, we stopped by the LCBO for some wine and picked up the Food & Drink magazine (page 278 of Holiday 2011) – love this edition. In it I found several recipes that can easily be adjusted to a healthier version and I’m including the one I made on Saturday here for you. I’m making another one tonight, and if it works out, I’ll post it too. We served this dish with lightly steamed bok-choy. In a deep cast-iron pan, I heated a tablespoon of coconut oil and added a minced clove of garlic. Once the garlic was smelling wonderful, I added about a cup of vegetable stock (or water would be fine too) then the coarsely chopped bok choy. I steamed it for about 5 minutes until it was bright green and fragrant, then took it out of the pan with a slotted spoon and squeezed lemon over top and sprinkled with sesame seeds. This is a delicious side dish packed with exceptional sources of iron, vitamins A and C, folic acid and anti-cancer compounds including glucosinolates. 1. Slice the flank steak against the grain into thin slices. In a medium bowl, combine the first set of ingredients and add to meat and marinate for 30 minutes. 2. In a small bowl, combine all seasoning sauce ingredients. 3. Heat wok over medium heat (I don’t have a wok, so used my Le Creuset pot). Add oil and stock. When hot, drain the meat from the marinate and stir-fry until browned (this doesn’t take long – about 30 sec to 1 minute depending on how thinly you cut the steak). Remove meat and reserve. 4. Stir in the chili, ginger, garlic and black beans. Add the vegetables and noodles. Stir-fry for about a minute until the pepper softens and the ginger and garlic become fragrant. Add in the seasoning sauce and bring to a boil, stirring. Return the meat and any juice and mix well. Before serving, add 1 tsp of sesame oil to the wok then pour contents onto a large serving platter. 5. Serve with bok choy for a delicious, nutritious dinner! Serves 3 to 4 as a main course.